After some unseasonably warm weather, things are starting to look more like March on the Alabama Gulf Coast. The winds are coming from the east primarily, and the water temperature is on the rise. The warmer water has caused the fishing in Orange Beach to become very productive. Speckled Trout are beginning to show up in the usual places they would be this time of year. 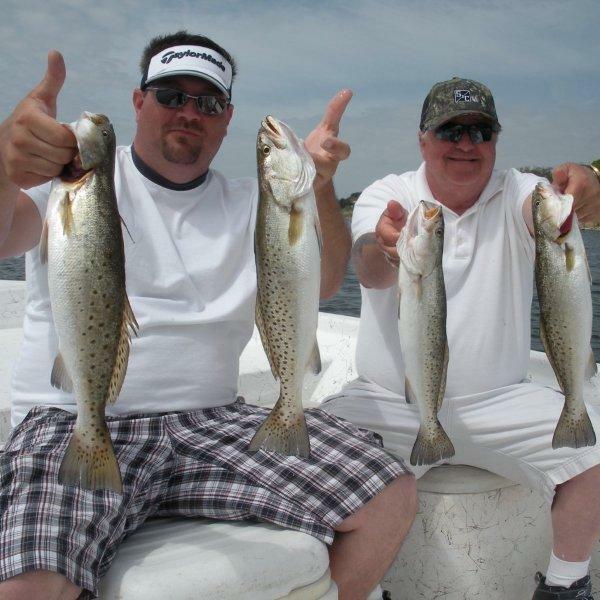 Live shrimp is the "Go To" bait for Speckled Trout fishing in March. Even though the water is warming, it is still cool, ranging in temperature from 60 to 68 degrees. Because of this, the Specks will be in relatively deep water this month. The "usual spots" as before mentioned vary from 12 to 30 feet in depth. This makes it easy to locate the fish because there aren't that many spots with that deep of water in our area. The fish are typically close to the bottom and can hardly resist a lively shrimp presented in a natural manner. Pompano have already begun migrating along the beaches near Perdido Pass in Orange Beach. We have a small window of opportunity to target Pompano along the Alabama Gulf Coast. April is considered the best month to catch this wonderful species, so it is encouraging to be seeing Pompano this early. The Pompano are fond of water temperatures that fall between 66 and 74 degrees. Sheepshead and Black Drum have been plentiful around the rock jetties at Perdido Pass in Orange Beach with some Redfish randomly mixed in. These fish are not nescesarily our prime target on my charters, but they provide some great action and excellent tablefare if the Speckled Trout bite is slow. These fish species are not as heavily affected by the type of cold fronts and high pressure systems that frequent our area in March the way that Speckled Trout can be. Visit our resevations page to book a fishing charter for the upcoming months. Inshore fishing in Alabama is a year round commodity.